Privacy in smartphone usage has become a major concern especially when so much of your personal data residing on it in addition to the increase in smartphone thefts. 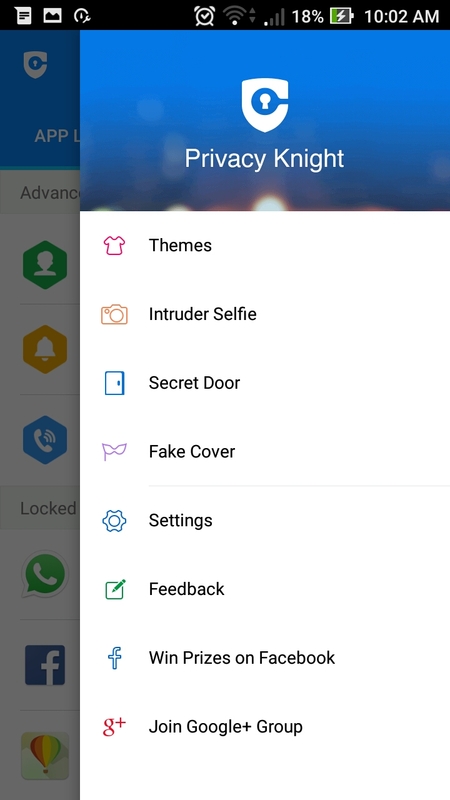 There are options provided in Android such as remote wipe but there is still a need to secure the phone and the contents within from time to time and in multiple ways. However, in an attempt to make the phone very secure it becomes a user experience conundrum with the user having to go through multiple layers of security to even start using the phone. 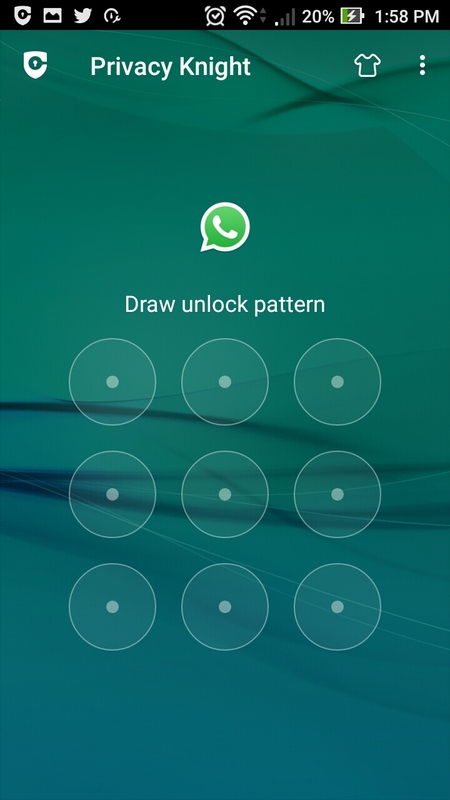 There is also another popular way of doing it which is to lock specific apps such as gallery or notes and such. Some companies like Xiaomi have introduced the “guest” mode in their MIUI interface which is a good move. 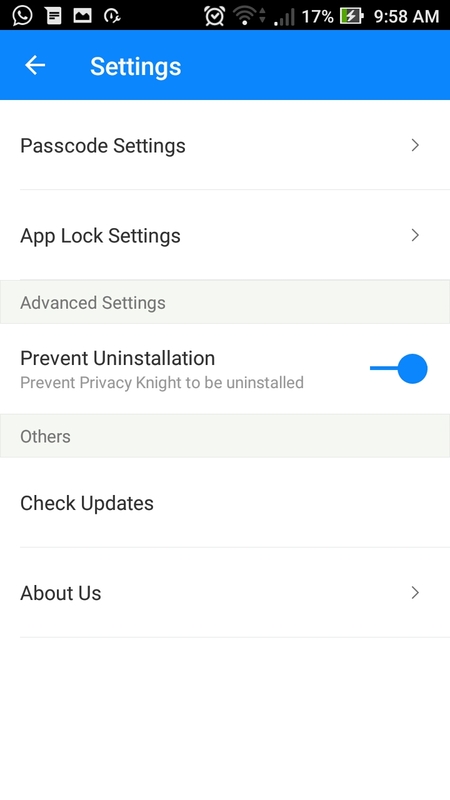 Speaking of Chinese companies, Alibaba has developed an app called “Privacy Knight” that has some cool tricks up its sleeve in not just securing apps and its contents but also helps you identify threats. The instance you install the app and open it, it runs a scan on all your apps and identifies the ones that can be vulnerable and lists them. You can then choose the ones you want to protect with just a single click. Once done you can set a pattern passcode that will be asked in case you want to make changes to access or to even access the particular apps. Once this is done, the app takes you thru the process of enabling the permissions for it to start functioning. That’s it! All just in 3-4 simple clicks you’re done. Inside the app there are menus in forms of tabs. 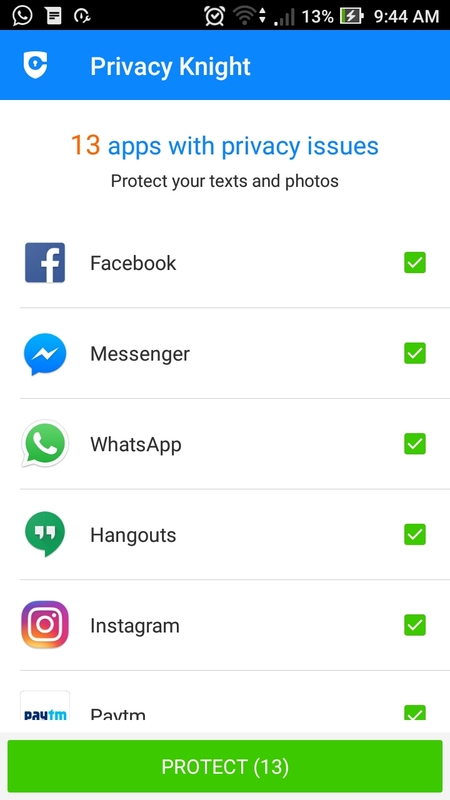 The App Lock tab lists the apps that are locked and can be unlocked in case you want to free them up for general access. 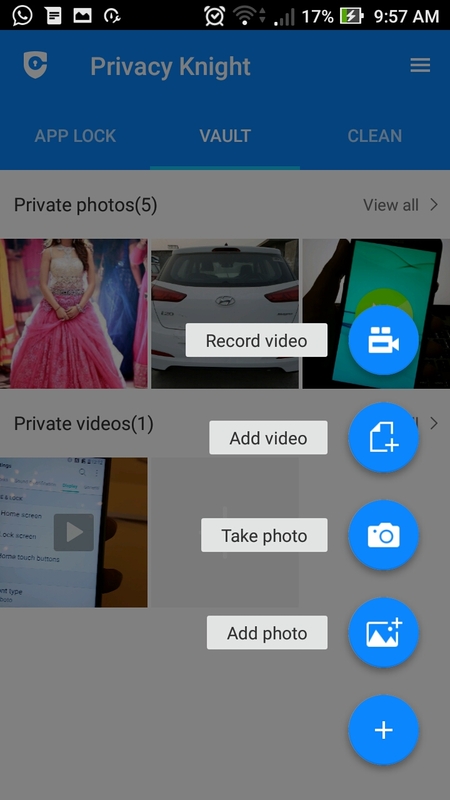 The Vault tab will help you pool in all your personal pictures and videos that you’d want to hide from anyone outside of your access and the final one is the Clean tab that works just like the Cleaner app that aggregates junk and unused files that are eating up your phone memory. Note: When using the Vault feature, unhide all of your photos and videos before uninstalling the app otherwise they may not be found. One of the coolest features of the app is the ability to have face detection for unlocking instead of the usual pattern unlocking. This is incredibly fast and Alibaba claims the unlock to happen within a second and it has been the case in our experience. This is very convenient as you’d not have to do any tap on the screen – tap on the app, the front camera activates and peep into the boundary and voila! app is unlocked. However, in certain cases it gets inaccurate in detection with a photograph of you placed in-front of the phone which makes it slightly insecure. If Alibaba can improve the algorithm on this one, it can be a formidable application. 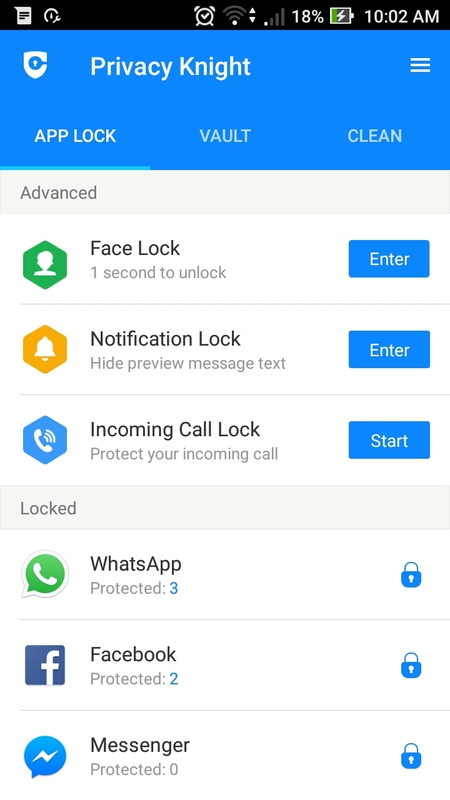 Some of the other cool features are the ability to lock the incoming notifications and calls in case you’ve handed over the phone to someone else or have left it on the desk and do not want anyone sneaking into your phone. And speaking of sneaking in, in case someone tries to break the lock, the “Intruder Selfie” option when enabled will take the snap of the invalid person trying to venture into your phone. This way you can know who tried to breach and take necessary actions. Apart from this, there are certain personalization options such as themes that will change the colour to give the entire app a different look. And in case you wanted to conceal or camouflage the app icon itself, the “Secret Door” option will turn the icon into a “Phone” dialer icon and one can access the app only via a password. 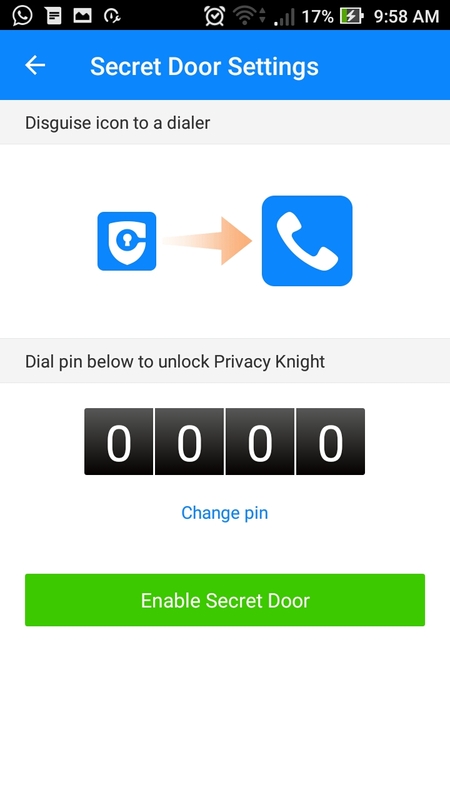 With no ads popping all around the place, some theme options being thrown in, the Privacy Knight is certainly an option that is worth your consideration. Navigations are simple and intuitive and in our usage of the app for over a week, it never did crash on us once. Some of our friends too were recommended to use this app and have found it useful. We surely suggest you to try the Privacy Knight, available as a free download at Google Play. 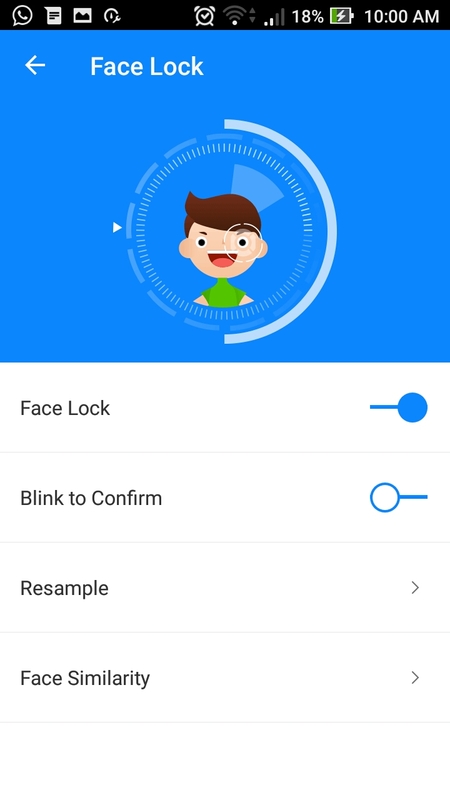 I tried the thumb lock application previously but it didn\’t work on my smart phone. 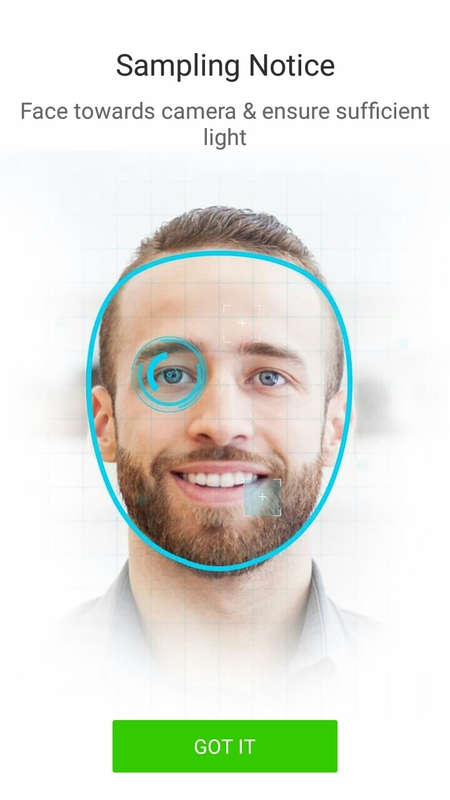 Hope this application works good and it recognize between different faces.